Central Vacuum Systems are a wonderful convenience to have in all homes. Whether your home is a sprawling mansion or a quaint cottage, central vacuum systems make cleaning easier, more efficient and faster. For this installation, our customers had lived in a home with a Vacuflo central vacuum for close to 20 years and after moving into a home without a central vacuum, they realized they couldn't live without it. This home was a modular home sitting on a full basement. Even though the house was finished, we were able to easily retrofit a system into the home. The upstairs was covered by 2 inlet valves on each end of the house. Because the interior walls in this home were 2x3 instead of the now standard 2x4, getting the tubing inside the wall cavity would be very difficult. 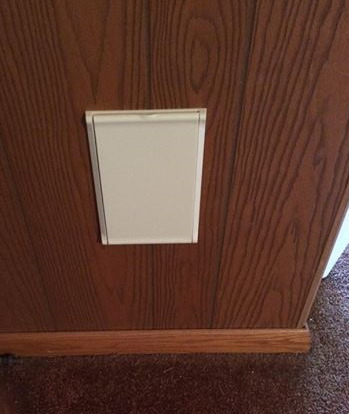 With the customer's approval, we brought our pipe up into the back of a closet, then into the wall to attach to an inlet on the other side of the wall. The visible pipe is concealed within a closet, hiding it from view. In the basement, a valve attached to a support beam and another one next to the unit completely covered the basement area. The customer selected a Vacuflo 466Q power unit which provides incredibly powerful suction for the 4 inlet valves and when paired with a Vacuflo EDGE attachment kit, their carpets have never been cleaner. The Vacuflo power unit is vented outside where the machine exhausts all of the fine dust, allergens and germs, keeping them from recirculating inside the home. A Lifetime Warranty covers the unit for the original purchaser protecting their investment. Call today for a free estimate on a central vacuum system for your home. One common misconception is when the motor on your power unit wears out, the entire machine needs to be replaced. If you're satisfied with the performance and dirt disposal method of your power unit, we can in most cases replace just the motor and you're be on your way again. However, if you would prefer a more powerful unit, a quieter unit, or a unit with easier maintenance, we can easily replace your power unit with a new, high quality power unit from MD Manufacturing or Vacuflo and you'll have more power and convenience then ever before. More Suction Power- With new, advanced motor designs, more suction power can be made than ever before. This improved suction makes cleaning faster than ever before. Quieter operation- With units designed for quietness in mind, the new power units are significantly quieter in the room where they are installed, normally in the basement or garage. This not only lowers the annoying vacuum noise in the room where it's installed, it also can completely eliminate the vacuum noise inside the living area. Easier dirt disposal- With MD Manufacturing's unique bagged units, dirt disposal has never been easier. Warranty- Protect your investment, new units come with factory warranties to protect your investment and to give you peace of mind. After we replace your unit, we will give you a full presentation on how to properly care and maintain the unit. We will also explain the warranty registration process and how to request service in the unlikely event you would ever need. While replacing your unit, we can also inspect and replace most inlet valves and deliver any new attachments or power nozzle sets. Central Vacuum Systems have made monumental improvements since the 1980's and 1990's and today's systems offer more convenience than ever before. To learn more about all of the upgrades and improvements available for your system, please call us at 724-349-8565 and we can discuss all of your options. One of the most commonly asked questions that we receive is: "Can you install a central vacuum in my existing home". The answer to this is yes. But what about a Hide a Hose? Thankfully, the answer to this is almost always, Yes. Although Hide a Hose needs more room for it's installation because if you're storing 40' of hose in the pipe, you need at least 40' of pipe. Where in a traditional system, you do not need a designated amount of tubing, making this installation a bit more flexible. Even with this taken into consideration, it is very rare that we cannot install a Hide a Hose central vacuum. Here is a perfect example of this. This home was built in the mid 60s and it's owners were just getting ready to rip up most of the carpeting and replace it with beautiful hardwood flooring. Looking for an easier way to properly maintain them, they turned to Indiana Vac to install a Hide a Hose central vacuum system. With just one 50' hose on the main floor and another 50' hose in the basement, their entire home was covered, including the garage attached to the basement. The main floor inlet valve was installed in a paneled wall, at electrical outlet height so the Hide a Hose retracts properly, and so it is less conspicuous on the wall. Powering this system is a USA Made MD SilentMaster S44. This unit can handle multiple Hide a Hose valves and has a unprecedented 10 year warranty that is completely transferable. The S44 uses MD's largest, 12 gallon HyperFlow bag that allows the user to maintain full suction power, even when the bag is full. MD units are Indiana Vac's "go to" unit whenever a customer is looking for a bagged central vacuum. For cleaning tools, the homeowners selected a TurboCat Zoom with a Riccar Soft Sweep floor tool. These tools, and the includes above the floor accessories, allow them to clean everything from floor to ceiling, and because it was installed with a RF handle controller, they can control the central vacuum unit from anywhere in the home, instead of having to go back to the inlet to shut off the suction. Recently, We installed a Hide a Hose System in a home built in 1894. This beautiful home still had the original, beautiful hardwood floors, A large sweeping staircase and acres of beautiful carpeting on the second floor. The owners tell us that it was always a challenge keeping up after their two dogs and their busy schedules. Once they saw Hide a Hose being demonstrated at the Indiana-Armstrong Home Show, they knew they had their answer. For just under 2 days, we routed the piping network throughout the home. Most Hide a Hose jobs take us under a day, but because of several unforeseeable obstacles, we were slowed down ever so slightly. With one inlet on the second floor, and one inlet on the main floor, both with 50' Hoses, the entire home was covered, allowing them to vacuum anywhere. Because the plaster walls in the home were so old, we decided to surface mount the Hide a Hose inlets, normally we only do this on garage or basement walls, but since we didn't want to effect the beautiful plaster work, the inlets were concealed in a closet and a cabinet, completely hiding them, but making them convenient and very accessible. The upstairs inlet, concealed inside the Master Bedroom Closet. Easily accessible and out of sight. Powering the Hide a Hose system was a USA Made, Vacuflo 566Q. This is a wonderful power unit for standard inlet systems up to about 8,000 square feet and Hide a Hose Systems, up to about 4 Inlet Valves. This is a True Cyclonic unit, meaning we vented it outside. 96% of all dust picked up is filtered out by the cyclones while the remaining fine dust particles and germs are exhausted outside the living environment. The Vacuflo True Cyclonic units carry a Lifetime warranty on all permanently installed components and a 3 year labor warranty. The customers elected for a TurboCat Zoom attachment kit and a RugRat Hand Turbo brush for keeping up after their 4 legged friends on their couches and smaller areas. The hardwood flooring is being kept clean by the innovative Axis floor tool that allows them to effortlessly and safely clean any kind of flooring surfaces. The unit is controlled by a radio frequency handle, allowing them to turn the unit on right from their fingertips instead of running back to the inlet to turn it off manually.